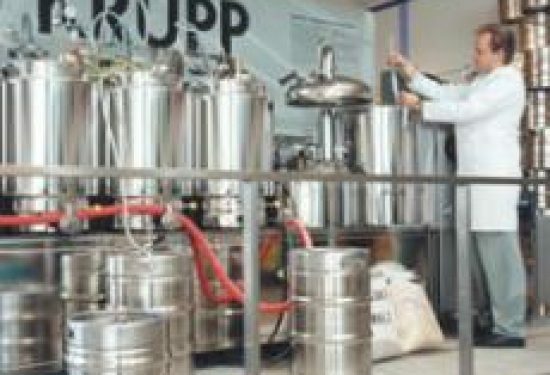 This system is designed to develop new types of beer, new recipes, to test new raw materials and to make exper-imental brews. In a big brewery all this cannot be done cost-effectively in a big kettle. The PICO50 system uses the same technological basics as the “big” SALM breweries. The remote heating system for mash and wort, the BREWMATIC system, the dual step wort cooler and the UNI-tank technology with el-ectronically controlled cartridge chiller are standard, also the heat recovery and the air compressor. The cooling system is also integrated in this unique plant. The PICO consists of two modules, the wort production module with brewhouse, whirlpool, remote heater, wort cooler, hot water tank, air compressor and power distribution system and the UNI-tank module with ice water cooling, serial and individual pressure regulation, CIP cleaning, electronically temperature regulation and rinsing compartment. or with a double module 2 brews/week with 21 days aging time.